Outsource2india's Product Animation team provide illustrative and high-quality realistic 3D animation and illustrations. The team has in-depth expertise in working with 3ds MAX and Maya for animation, and Inventor, SolidWorks, AutoCAD and other commercial 3D modeling packages for 3D modeling and animation projects. Our 3D product animation of mechanical parts, components, and machines are created to ensure client requirements are met with accuracy. We create 3D models from sketches or drawings with 2D CAD data or specifications and build detailed 3D models of the product. Using product animation, we help you showcase the functionality of a product and highlight any specific component as per your request. Outsource2india is equipped with the latest technology, infrastructure and is backed by sufficient bandwidth to meet any complex requirement. Outsource2india's animation experts can work on engineering drawings, CAD files or product samples to provide true-to-life animations of your products. For mechanical 3D animations that require more precise and detailed work, our engineers and animation experts work with story boards, keeping in mind the end-user perspective. Product samples help us gauge the client's expectations and standards and our team works towards meeting these expectations. For cost-effective, true-to-life 3D renderings of mechanical product animation, you can partner with Outsource2india and get the best out of your investments. We work alongside you to shorten the project lifecycle and ensure improved performance of your product right from the concept to the final stages. 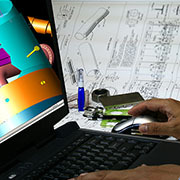 If you have a 3D Mechanical Product Animation requirement, trust us to help you out and that too within your budget. Just send us an e-mail or call us to help you out as soon as possible. We work on global time zone to cater to client needs 24X7. Contact us today to outsource mechanical 3D product animation services to India and learn more about our other engineering services!